“Its just a bunch of banjo playing, said Bela Fleck as he cut us a coy smile. The Charlotte, NC audience had just erupted with applause and catcalls after he opened with two songs on his banjo. A muggy night beckoned Fleck and Toumani Diabate to one of the citys grittier venues: The Neighborhood Theater. Fleck and Diabate were fresh off of a six-week break after previously touring with a full orb of African musicians. All of these ventures an outcropping of Fleck’s recent time in Africa where he sought to connect with the roots of music. If the term roots just conjured images of Appalachia mountain porch music, allow me to gently redirect your mind: Appalachian roots music is to African roots music as your 18-inch raised bed backyard garden is to the 60-meter deep Acacia tree roots in the deserts of Africa. Here in the young country of America we throw around the roots term far too handily. The roots of the banjo do not originate in the mountains of the southeastern United States. They were transplanted here, stretched over the ocean by slave ships from Africa. Fleck went back to this source, visiting Uganda, Tanzania, The Gambia, and Mali. There he befriended and collaborated with musicians along the way. The resulting documentary, Throw Down Your Heart, won the Audience Award at South by Southwest in 2008 and Fleck released an album by the same name. 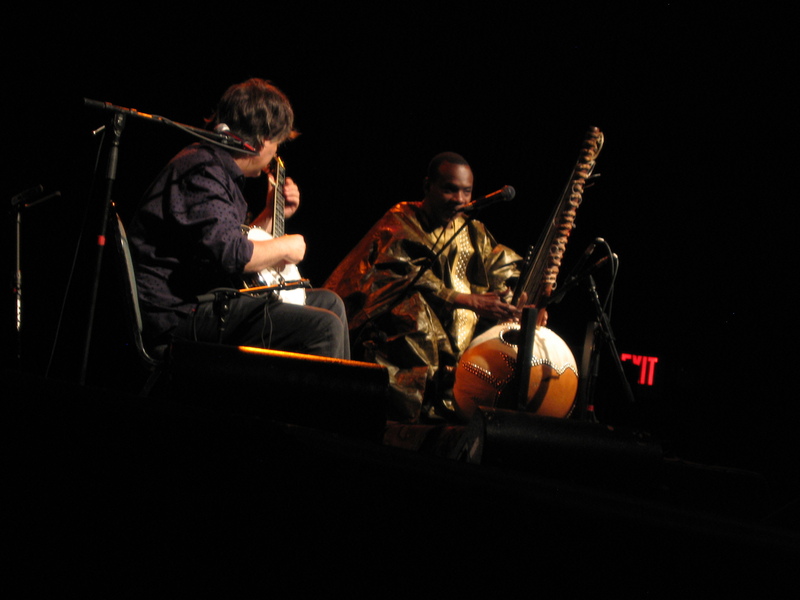 On this night it was just Fleck and Diabate, a world-renown Kora player from Mali. Fleck opened the night with a seven song solo set, where he transitioned among his traditional and cello banjos as well as the akonting, an African stringed instrument thought to be the patriarch of the modern banjo. He played songs from Tanzania then Mali and Gambia, the latter filled with chord and tempo changes. The cello banjo has a deeper, stronger sound than the others. Admittedly, it took me a few songs to settle into Flecks finessed and intricate style (I think Ive been to one too many Avett Brothers‘ shows this year…). He then turned the stage over to Diabate. Diabate introduced us to the kora, with music first then words. This African harp faces the musician, not the audience. Since we could barely see the motions of his hands, we were captivated by both the sound and the mystery of how he created it. After the song he spoke, asking grace for his broken English (which Fleck is teaching him) and introducing us to the muse of the night: the kora. we were under the spell. 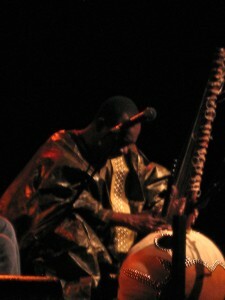 Something he said made the audience gasp: He comes from a family of seventy-one generations of kora players. Seventy-one generations! Heres the math: Estimating 30 years for one generation, his family music spans 2,130 years. This man is standing upon, or shouldering himself, the weight of thousands of years of tradition. I suspect it varies between the two at a given time.
. until the two master craftsman opened wide up. They played back and forth challenging, laughing, and taunting each other. The two men of different ancestry, different skin color and different instruments were completely at ease, smiling and enjoying every second. Remaining individuals and honoring each other’s differences but finding a common stage to share. This night was so much more than a bunch of banjo playing.